It took awhile to extricate ourselves from Bielsko Biala but we eventually did so. At lunchtime we arrived in Kety, a small town equipped with square and fountain that came in handy for mending a puncture. Here we saw signs to Oswiecim (Auschwitz) and tour buses going in that direction. Also a lot of utility cycling, unlike in Cz where recreational cycling is popular but you don’t see people cycling to the shops. 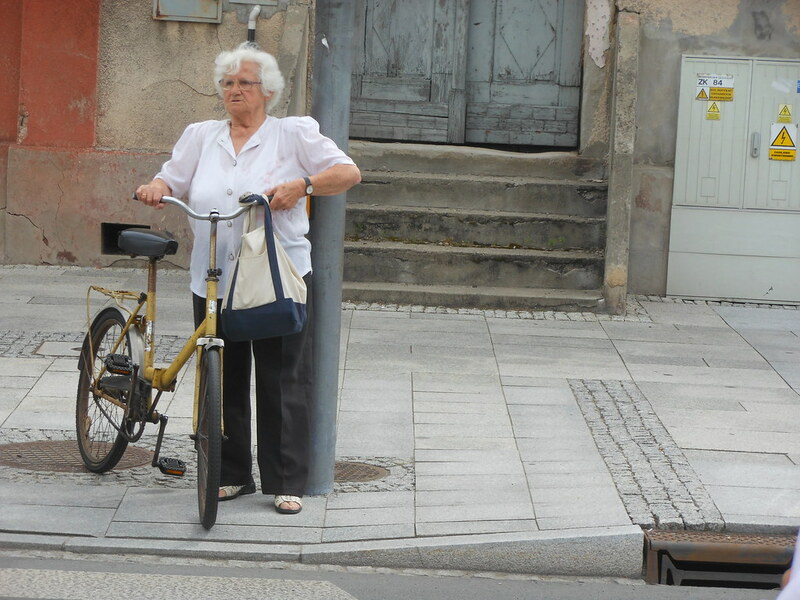 When you see elderly women on bikes with a shopping bag on the handle bars and bikes parked unlocked on the street, that shows it’s part of daily life. 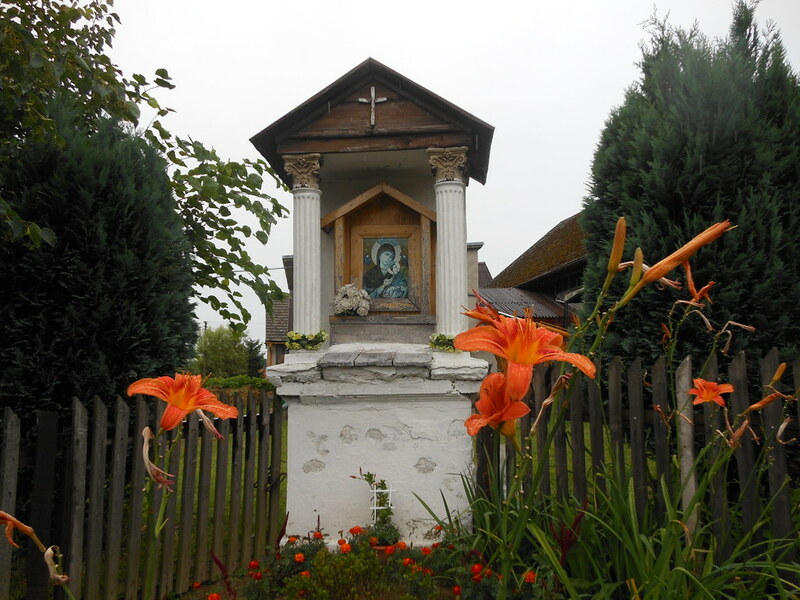 In Cz it is common to see roadside crucifixes; in Poland, shrines to the Virgin Mary and, less frequently, memorials to the Polish Pope who was born in this region. Light rain fell for most of the afternoon, not enough to get drenched. We had a few geographical adventures – dirt road to river where we were expecting a crossing but there was none, several km in wrong direction along horrid road with many trucks and no shoulder. We saw our first east European storks – three of them in a precariously located nest on top of a power pole. 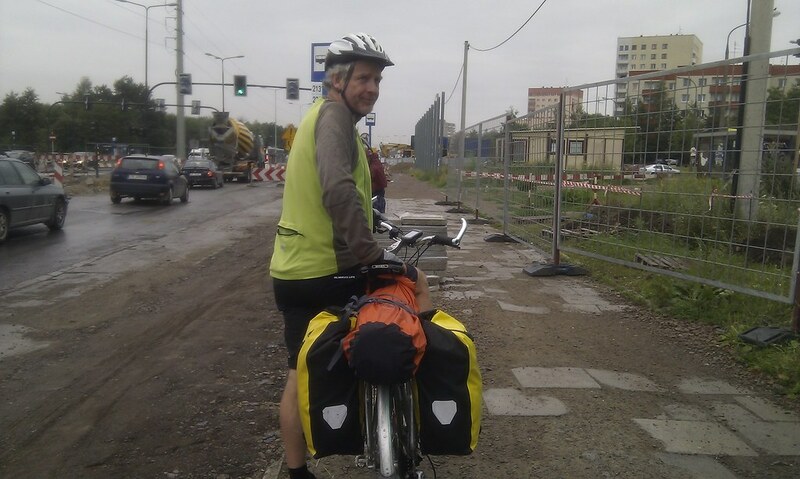 Then we battled our way into Krakow, grey sky, industrial landscape, traffic jam of vehicles heading out of the city, road works, rain getting heavier. When we pass people we usually give a wave and a smile, but have found that these are often returned with a blank look or no eye contact at all. That’s a bit disconcerting. So it was nice to be helped by a young man on Dutch style bike who confirmed we were on the right track in the suburbs of Krakow. We went to the address of our warmshowers host on the northern edge of the city, found no-one home, so retreated to the centre and Hotel Europejski. This entry was posted on 14 July 2012 at 7:30 am and is filed under Poland. You can follow any responses to this entry through the RSS 2.0 feed. You can leave a response, or trackback from your own site.